Leverage Axis LMS to create and track Continuing Education Learning Programs. If you’re working with a state or a governing board that works with certifications, Axis LMS provides a way for you to deliver renewable certifications / licensing to your users! By assigning your existing courses a CEU value, you can structure your online training into Continuing Education Certification Programs — enabling your users to both certify, and re-certify on a regular basis. To earn their initial certification, users will be required to complete the designated course inside of Axis LMS. Afterwards, renewal will require users to earn the necessary amount of CEU credits, which are awarded by completing courses that have CEU credits eligible towards the certification. Things like setting up email reminders to your users (letting them know when its time to re-certify) are also part of the options you can configure for your Continuing Education programs. Within Axis LMS, Certification Programs are created as a way to deliver Renewable Certifications to users. These Certifications are dated for so many days / months / years, and before that date comes, users are expected to have earned the CEUs (Continuing Education Units) required to renew that certification. 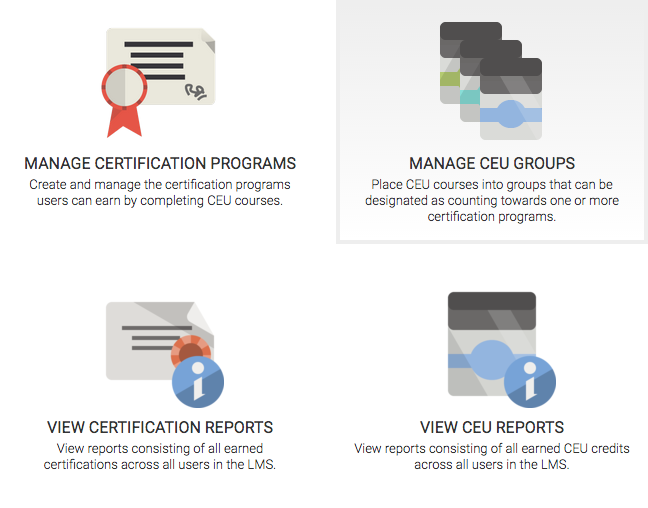 Users earn Certifications after completing a specific course. After its completion, the user is given a Certification number that is valid for a certain amount of time. In order to renew their Certification, the user will need to achieve a designated number of CEUs, which a user primarily earns through course completions. While inside of your Talent tab, select Certifications & CEUs to begin creating and managing Certification Programs, and the Course Groups that they’re made up of. The first step to creating Certification Programs is assigning CEU values to your different Courses. 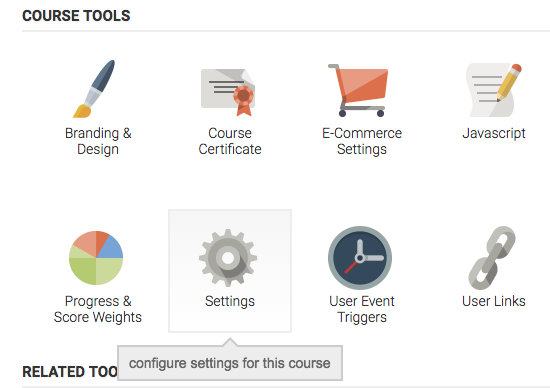 Inside Axis LMS, each Course will carry the same CEU weight for every Certification Program it is present in. To assign CEU Values to your Courses, open up your Learning Tab, and navigate down into one of your Courses. Select the Settings icon, then look for the CEU value. Save your changes after submitting a value, and your Course is now eligible to be used within CEU Course Groups. CEU Groups are groups of one or more courses that are capable of being used in Certification Programs. When creating your Certification Programs, you will assign one or more Course Groups to that program. Any courses completed from within those groups will contribute towards a Certification Program’s Recertification Requirements; once the user has is met or exceeded that requirement, the user will be recertified automatically. Perhaps the best usage case for why Certifications are composed of Course Groups rather than individual Courses is when retiring or adding new Courses. Because Course Groups can be used in any of the Certification Programs you create, when a course is removed, or a new course is created, you only need to make your changes in one place, rather than adding and removing in every Program you’ve created. After you’ve associated a CEU value with your courses, those courses can now be added into CEU Groups. To add a New CEU group, open your Talent tab, select Certifications & CEUs, then begin Managing your CEU Groups. Selecting Add a New CEU Group will bring you to a new page, where you’ll be prompted to fill out some different fields. The CEU Group Name is how this group of courses will appear when you’re creating your Certification Programs. You’ll want to make sure the name has some meaning to you, as this is an admin-facing identifier; users will not see this. The most important aspect of creating your groups is what courses are represented in that group. You are able to toggle individual courses one by one, or (if you have a smaller selection of courses) you can check / uncheck them all. 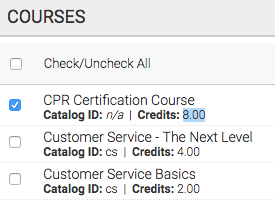 This will be especially useful early on, but as your CEU catalog expands, you’re going to want to select your courses individually. While checking Courses in the Course listing, each Course will let you know how many CEU Credits it awards, as well as whether or not it is an active course. 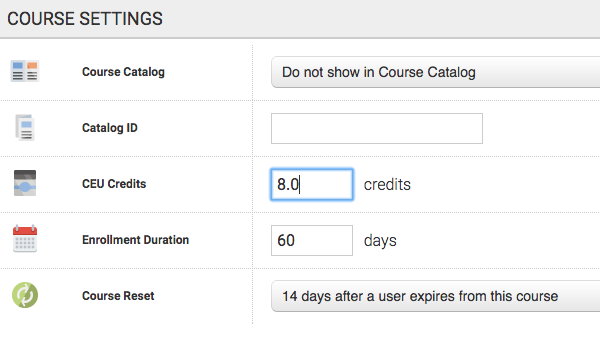 If an inactive Course is toggled, users who have already completed that course will retain their credits; but no new users will be able to access the course. After creating several CEU Course Groups, you’re ready to build your Certification Program. Certification Programs are created from inside your Certifications & CEUs area, then Managing your Certifications. Selecting Add a New Certification Program will prompt you to fill out some information about the Program. The Program Name is the name that this Certification is represented with on the admin interface. It should be meaningful to the admin so that you can easily identify and work with it when the need arises. Certification Numbers are created with a random string of of characters, prepended with the Alpha-Prefix – a 2-5 character long string. 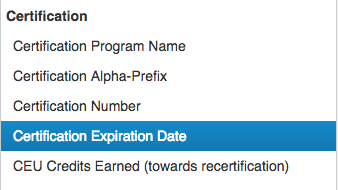 If you suspect you will ever import Certifications, it is best practice to give each Certification Program a unique prefix; though, this not enforced. 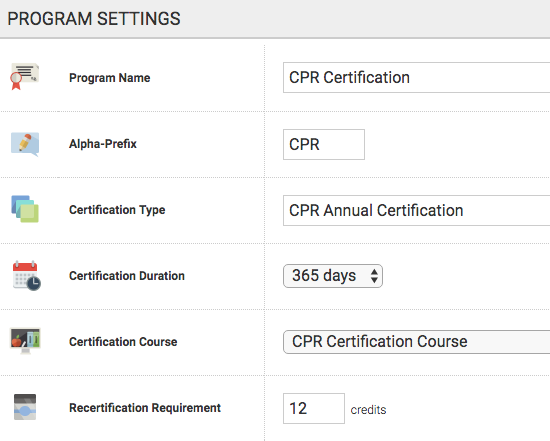 The Alpha-Prefix also helps both users and their managers distinguish what Program awarded their Certification and, if you’re working with state boards, can be used as a way to meet their Certification structure requirements. The Certification Type is how this Certification will be displayed to the user. Users will be able to see their Certifications and Certification progress through the Certifications widget. Each Certification awarded through Axis LMS is valid for the length of the Certification Duration. After completing their initial certification, or immediately after becoming re-certified, their Certificate valid dates will be set this many days in the future. The expiration date will replace the existing expiration date; not extend it. Assigning a Certification Course designates which course needs to be completed for the initial certification. You can gate this course behind other through a variety of Event Triggers and other requirements; but as soon as a user completes and passes this course, they will have earned this Certification. If you choose to not select a course, the initial Certification of this program can only be manually assigned; but users will still be able to re-certify through Axis LMS. After a user has earned this certification, the Recertification Requirements will need to be met by the user to earn this Certification once more. Only eligible courses from the associated Course Groups will be able to award CEUs for this Program. Similar to other emails inside Axis LMS, the Expiration Email will send out automatically when its requirements are met. Up to three emails will be sent out, all pivoting off of users’ certification expiration dates. When the date is a match, an email will be sent using the Email template below the reminder drop-downs. This email template also uses some Certification specific placeholders, such as Certification Expiration date, and the user’s Certification Number. At the end of the Certification Program creator, you’ll be able to toggle the different CEU Groups you have previously created. Check what groups should be able to contribute to this Program’s Recertification, then save your changes. This entry was posted on Friday, March 31st, 2017 at 2:11 pm	and is filed under ELearning 101. Responses are currently closed, but you can trackback from your own site.